ONE of the kingdom’s most popular dining destinations is dishing up a delightful new buffet of Arabic cuisine with a live cooking station and a touch of fusion fare to tantalise the taste-buds. The Pearl of Arabia night was launched on a Saturday evening and has proved so popular it is now being run on a Friday night too at The Crowne Plaza Bahrain’s La Mosaique. French Executive Chef David Miras, one of my favourite culinary masters on the island, often comes up with unique twists when it comes to his international options available at this spacious and elegant all-day dining restaurant. This time he and his kitchen wizards have surpassed themselves with a mouthwatering prize series of pizza options. The choices include Shish Taouk Pizza, Lamb Kofta Pizza, Seafood Pizza and Halloumi Pizza and each succulent slice is a heavenly combination of one of Italy’s most famous inventions with a unique Arabic twist. 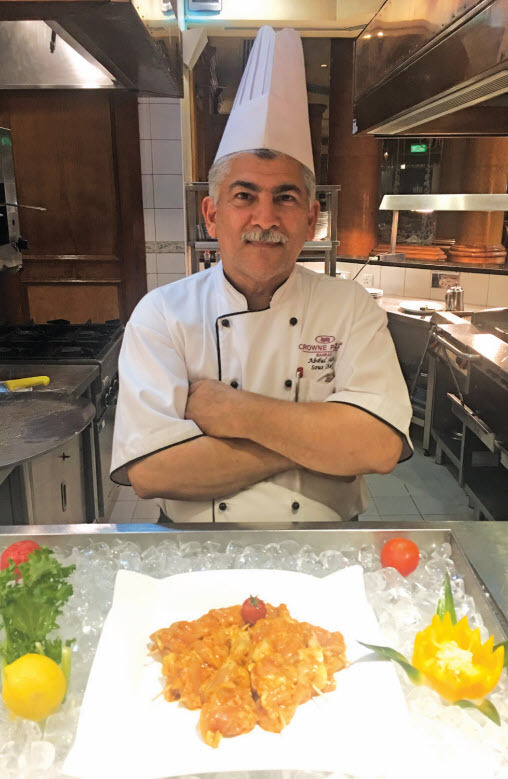 Bahraini Sous Chef Abdul Nabi was manning the live grill last Saturday and recommended the Lamb Chops and Lamb Kofta, marvellously marinated with his secret recipe of spices and delivered to the table. The chops were the finest examples of one of my favourite meaty marvels I’ve ever tasted. Cooked to a medium majesty they were thick and succulent and were well worth the visit alone. I accompanied the dish with a selection of salad items, crisp and sharp and one of the reasons I often recommend this restaurant to friends and acquaintances. There’s never anything limp about La Mosaique. The Pearl of Arabia provides an amazing mix including Makdous, Labneh, Shanklish, Moutabel, Vine Leaves, Hummus and there was even a ‘create your own’ Fattoush, a Syrian or Lebanese salad made from toasted or fried pieces of traditional khubz bread, combined with mixed greens and other vegetables, such as radishes and tomatoes. Other Arabic delicacies on the mixed grill counter included a delightful Doori fish fillet and solo Shish Taouk, ideal for those on the Keto Diet, inlcuding the good lady wife Kathryn, who want to avoid the dough in the pizza! The Shawarma rotisserie was as popular as ever but the big rush on the night was for everyone’s favourite, the slowly-cooked Lamb Ouzi offering melt-in-your mouth meat pieces within a delicately-spiced bed of rice. The soups being served were Lentil and my choice, a warming Cream Broccoli. Leave room for a helping of Pasta Arabiata, a tasty take and clever misspelling of ‘arrabbiata’ which literally means ‘angry’ in Italian; the name of the sauce refers to the usual spiciness of the chili peppers and Chef David’s version is a little kinder taking into account local preferences. Grilled Lebanese Chicken, Lamb Fasolia, Fish Harra and Chicken Salona were further choices in the buffet line-up, explained with impressive knowledge by delightful supervisor Kalpesh. Arabic juices such as Jalab were ready to be poured alongside fresh mango and pineapple and for those with a sweet tooth, the dessert display featured Umm Ali, of course, Baklava, Mamool, Mahalabia, Basbousa and Jalebi. There was a selection of fresh fruit and cakes too. Pearl of Arabia makes for a marvellous night out at a very favourable price of just BD13net. There is also a beverage package available. Call 17531122 to book a table and for more information.